Surveying is an integral component of land usage by civil engineering, GIS, GPS, municipal planning, construction, and drafting. Levels of training include certified technician, Surveyor-In-Training, and Registered Professional Land Surveyor. 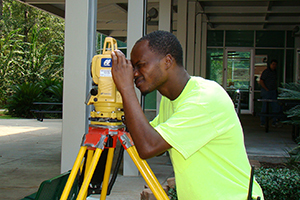 Prepares students to enter a high-tech profession that uses state-of-the-art equipment to determine the exact location and measurement of points, lines, and contours of the earth’s surface as a land surveying technician. S & V Surveying Jeffrey Moon & Assoc.